An elementary school teaching staff bands together to battle their students when a virus mutates children into cannibalistic creatures. A viral outbreak at Happy Poultry Farms infects the supply of chicken nuggets distributed to schools. At Fort Chicken Elementary, young student Shelly becomes patient zero after eating one of the tainted nuggets. Teacher and aspiring writer Clint Hadson listens to his mother’s critique of his manuscript for “Keel Them All,” a horror novel about a haunted boat. Clint leaves his mother’s house to work the day as a substitute teacher at Fort Chicken Elementary. At the school, Clint meets with Vice Principal Simms before introducing himself to fellow teachers Doug, Tracy, and Rebekkah in the teacher’s lounge. Clint also reunites with Lucy, an old flame from when he lived in town 15 years earlier, but learns that she is in a relationship with Phys Ed teacher Wade Johnson. Clint has a run-in with a student named Patriot during class. At recess, Shelly succumbs to the virus and attacks fellow students. As the infection spreads across the playground, Wade flees from the rabid children and takes refuge inside the school with the rest of the teachers. The adults watch in horror as the children attack Sheriff Dave when he arrives on scene. Meanwhile, crossing guard Rick is trapped in his van while high on mushrooms. The infected children descend on the teacher’s lounge. Uninfected students Calvin and Tamra hide with the teachers. Calvin tells everyone that Shelly has cooties. Clint and Wade argue about what to do. Wade and Lucy discover a wound on Clint and briefly quarantine him. The teachers decide to wait until 3pm to signal for help when parents arrive to pick up their kids. However, they realize that the idea is hopeless after infected student Racer relentlessly attacks his baby brother and unsuspecting mother. The children attack the teachers again. Wade is forced to club Patriot to death with a fire extinguisher. While Wade confronts Lucy about her feelings for Clint, Doug dissects Patriot’s infected brain and discovers that the virus only affects those who have not yet gone through puberty. Japanese janitor Hitachi finds the teachers. The infected children attack again and everyone hides in the basement. Calvin goes into diabetic shock. Clint makes a plan to use the air conditioning ducts to get a candy bar for Calvin from the vending machine while also retrieving the keys to Wade’s truck. As the smallest capable person, Clint is sent to make both runs. Lucy chastises the others before joining Clint in the vents. Clint and Lucy eventually succeed in their tasks and return to the others after partly discussing their feelings for one another. Clint confesses to Lucy that he knew she taught at the school and their reunion was not coincidental. Clint also admits to the others that he had been working in New York as a substitute teacher, and not as a writer like he had told everyone earlier. Over walkie-talkie, Wade has a heart-to-heart with Lucy. Clint interrupts to say he will back off. The teachers arm themselves with gym equipment and take to the halls to make their escape. Hitachi uses martial arts. The group makes it outside where the teachers battle the children on the playground. Wade tosses his keys to Clint just before being seemingly devoured by an infected horde. Everyone else escapes. A stowaway child attacks in the pickup truck and the vehicle spins out of control. After the child is ejected, Clint backs up the truck and impales the kid’s skull on the trailer hitch. The survivors escape to the nearby town of Danville. Television newscasts reveal that the virus has become a pandemic throughout the country. Doug realizes that the virus is foodborne and determines that they need to find one of the infected chicken nuggets in order to manufacture a vaccine. Infected children attack again. The group barricades themselves inside a building. Doug eventually locates one of the infected nuggets before they find themselves surrounded one more time. Wade inexplicably returns to rescue the group by squirting an infected mob with gasoline and lighting them on fire. Everyone subsequently escapes in Rick’s van. A post-credits scene shows Hitachi still in the school. Leigh Whannell is responsible for co-creating two of the biggest contemporary horror franchises with his terrific scripts for the “Saw” and “Insidious” series. Whether partnered with Triumph the Insult Comic Dog or with the cast of “30 Rock,” Jack McBrayer consistently impresses as an outstanding comedic actor. Ditto Nasim Pedrad of “Saturday Night Live.” Alison Pill of “The Newsroom.” Rainn Wilson of “The Office.” Jorge Garcia of “Lost.” Elijah Wood. Run through the list of notable names attached to “Cooties” and anyone would be right to expect a raucous riot of horror-comedy certain to split sides and shake out screams. Except it isn’t and it doesn’t. When New York City dashes his horror novelist hopes, likable loser Clint lands back at his mother’s house in the Midwestern Mayberry of Fort Chicken. There, Clint picks up part-time work as a substitute at the small town’s eclectic elementary school. Filling out the teacher’s lounge roster are repressed homosexual Tracy, socially awkward Doug, former flame Lucy, and Lucy’s current beau Wade, a mustachioed macho man and gym teacher with more in his paunch than he has in his pecs. Clint’s first day at work quickly resembles one of his novels when a virus-oozing supply of chicken nuggets makes its way under the cafeteria heat lamps. Patient zero takes one bite out of the nugget and another out of her classmate as the infection spreads across the playground, turning students into cootie creatures while teachers run for cover. Clint and his compatriots then band together to battle salivating schoolkids as the outbreak overwhelms and the outlook for survival grows grimmer with each passing period. 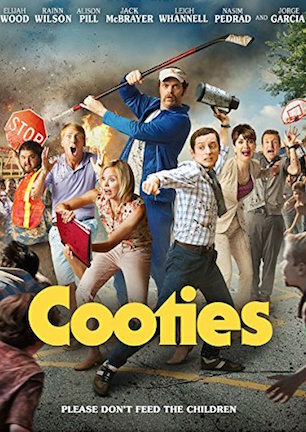 “Cooties” creates characters with singular quirks, resulting in stereotypes so one-dimensional that jokes cannot avoid redundancy due to overuse. Rainn Wilson’s tic is that his tongue ties whenever he repeatedly describes his truck’s “dual wheel well.” Wilson is funny enough on his own to earn a half-hearted “heh” on the gag’s first employment, but that “heh” arcs into a sigh before falling into a groan once the usage count grows innumerable. Leigh Whannell’s character does the same. His gimmick is to bark at people to stop doing things they are already not doing, like shushing noise during stretches of silence. As before, what musters amusement on the first go limps into a faceplant by the umpteenth time around. Then again, at least their thin characters provide some sort of purpose to the plot. Time would be better spent attempting to solve the Fermat-Catalan conjecture than determining the point of Jorge Garcia’s unnecessary inclusion as a shroom-addled stoner hallucinating giraffes in his van, and interacting with virtually no one from the core cast until the reshot finale. Similarly cringe-worthy writing dots the dialogue. An already absurd visual of Rainn Wilson clubbing cannibalistic kids with a lacrosse stick while clad in football shoulder pads is made more so when he snarls, “I’m giving you kids an ‘F’ – for f*ck you!” Co-star and co-writer Leigh Whannell saves the worst line for himself by muttering “nugget out of here!” to prompt escape after retrieving the tainted chicken product. Jack McBrayer is effeminate. Elijah Wood is petite. Lame puns apparently have not gone out of fashion. These are the best jokes this crew is capable of? This is not well-constructed humor. This is comedic fruit hanging so low that it drags ruts in the dirt. As for the horror half of the movie, the storyline runs through a standard cinema scenario for a typical zombie outbreak. Characters fret over wounds and fight about who might be infected. An unlikely hero rises to the occasion. Survivors fortify defenses before being overrun only to escape to the next location where the same steps are repeated. Nothing that happens is fresh, and nothing that happens is frightening. Another disappointing element is an almost-romance between Elijah Wood and Alison Pill, whose subplot instantly halts an otherwise relentless pace to develop their would-be relationship into a dead end. The couple’s dynamic is more important to the script than the attention it is given onscreen, and the thread is abandoned without reasonable resolution thanks in part to a reworked ending confusing as much as it corrects from the cut first screened at Sundance. It’s as uncommitted as anything else put into play, including a late-game homily concerning underappreciated educators that misses the mark as a heartfelt theme. “Cooties” is a broken film that never finds a satisfying way to fully come together. The 20-month gap between its January 2014 debut and September 2015 theatrical release is evidence of the effort required to tinker with the pieces, yet the film still comes up short with too scattered of a vision. “Cooties” deserves to be more enjoyable than it is, but only one hand is needed to count legitimate laughs. That’s a shame given the potential of the talent involved, as this is a group capable of much cleverer work. May 6, 2015 by Ian Sedensky.